Gurren Lagann is arguably one of the most irreverent and over-the-top mecha series ever to be released. It has a wild sense of style and quite honestly the series is unique and imaginative right from the start. While it certainly does not have the most refined story ever created it's definitely one of the most enjoyable rides we've taken in a while. Few shows are this upbeat and Gurren Lagann has a lot of fun while never taking itself too seriously. Bandai's first DVD release comes with two discs and a total of nine episodes which definitely gives us a meaty look at the series. Let's just say that if you appreciate mech shows then this one has to be in your collection now. Gurren Lagann begins underground with a digger named Simon working his drill under the watchful eye of a taskmaster. What he's looking for isn't necessarily made clear but along the way he discovers a talisman that he keeps for himself. Shaped like a drill bit, this pendant has a strange green glow which signifies that it's definitely not from around here. From here we see Simon and his town folk in their drab underground city where the sky is merely a rumor and there is no surface; at least according to the elders. That's when Kamina explodes onto the scene. Kamina refers to himself as Simon's big brother though the two aren't really related. The two are really just friends though seem to be an unlikely pairing as Simon is rather timid and Kamina is dangerously brazen. We discover that the source of Simon's meekness is a product of his upbringing and having his parents die at a young age due to an earthquake and tunnel collapse. Ever since then Simon began digging and hasn't stopped. Because of that Kamina respects him and finds his tenacity endearing though he sees qualities in Simon that he doesn't see in himself. At any rate Kamina is confronting the village elder one day and starts going off about how he's going to see the surface sky. 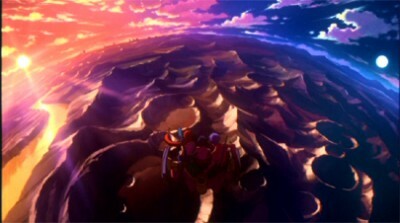 The people treat Kamina like an outcast but he knows that the surface exists because his father took him there once before he left to explore it. With his very public emotional outburst Kamina is locked by up Simon discovers something that is simply too good to keep a secret. Just then a monster comes crashing through the cavern's ceiling and along with it is a beautiful redhead dressed in a bikini. 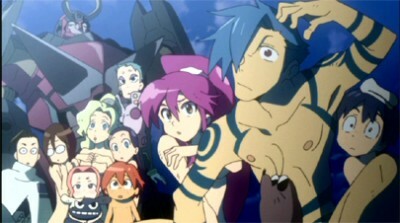 The two are fighting and naturally Kamina wants to protect her, his friends, and Simon. Things aren't really going their way though so Simon takes the two to the object he found while digging; a large head with a seat in it. When they get there Simon decides that it can be piloted and they can use it to fight the giant monster back in the village. This head reacts to the drill bit that he found earlier and boom, the thing sprouts legs and arms and blasts into battle. The monster known as a Gunman proves to be no match for Simon and his head (now named Gurren by Kamina). Appropriate the object sprouts drills as weapons and the face on it reacts in conjunction with Simon's. It's all over-the-top but oh so gloriously ridiculous. With their new found toy the two friends with redhead in tow blast towards the surface and don't look back. What they find is a reality unlike anything they ever dreamed of. Humans do live on the surface but they live in constant fear of beings known as Beastmen. These animalistic creatures portray several human characteristics and follow the lead of a supreme being of the Beastmen. To make a long story short there is a pack of humans who has rebelled against the Beastmen and their machines known as Gunmen. Naturally Kamina's brazen spirit wants to join their ranks and he drags Simon along for the ride. I'll attempt to keep the spoilers low from this point on because there are some truly surprising twists that come about during the course of these nine episodes. Basically due to Kamina's never say die attitude he steals one of the Beastmen's Gunman which is something nobody ever thought possible. He names it Lagann and in one particular fight he gets Simon's mini-Gunman to combine which is another thing that was believed to be impossible. This makes Gurren Lagann and unstoppable force for the humans and very soon they are taking this can-do attitude to heart. Kamina inspires humanity to fight the Beastmen for their existence and soon there is a whole army of stolen Gunmen marching towards the Beastmen's base. As ridiculous as this show is and as lighthearted as the plot can be, I must admit that I loved every minute of it. Character development is leaps and bounds beyond what you'd expect from a series such as this. Kamina, Simon, and Yoko are all rounded out fantastically and there is some real emotional weight being thrown around here. It's not ever series that can make you tear up when something bad happens and man, this one had me on the verge. After nine episodes I have grown so attached to these characters that I can't wait to see what happens next. If you have never heard of Gurren Lagann then it's time you pay attention. This is one of the top series of 2007 and quite honestly it stands as one of the best series I have watched in a very long time. The action is so gloriously over-the-top that it's infectious. It's not quite a parody and it's not quite homage but rather its own entity within the mecha genre. Go buy this series now and you won't be disappointed. All you're going to find on these two discs are some clean animations and Bandai previews. That's rather skimpy for a show this popular but I suppose after its history we should just be thankfully that we're getting a release here in America at all. 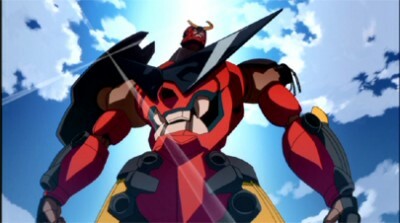 Dare I say that Gurren Lagann is epic. Yes it's ridiculous, irreverent, and the plot isn't exactly the strongest but my goodness is it entertaining. There are so many reasons this show works though the best of which are the characters and action. Simon and company are well-developed and the fluidity of the episodes helps the relationships and progression of the story. After nine episodes it's not entirely clear where this series is going but one thing is for sure; it's a hell of a ride. Add this to your watch list now!